4 pc. 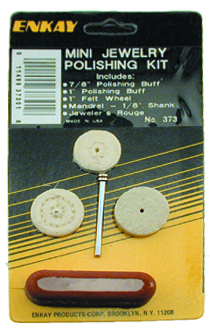 Mini Jewelry Polishing Kit includes a 7/8 in. spiral sewn buffing wheel, a 1 in. spiral sewn buffing wheel, a 1 in. felt wheel , a 1/8 in. shank, and a 1 oz. bar of Jeweler's Rouge. Perfect for intricate light duty polishing of precious metals like gold and sterling silver. All three wheels can be used with the 1/8 in. shank included in kit. For use with Dremel Tool or similar rotary drills. Must be used with polishing compound. Works best at lower speeds around 5,000 RPM.